On 23 June 2016 the UK voted to leave the EU and the political and economic landscape changed irrevocably. Brexit negotiations have been at the forefront of the political and business agenda with lawyers playing a crucial role amidst the ongoing uncertainty. Objective: To position our law firm clients as experts on the implications of Brexit, as it will affect the financial services and life sciences sectors, and from the perspective of finance, funds, corporate, data protection, litigation and employment lawyers. Strategy: We co-ordinated our PR campaign with our clients’ marketing and business development initiatives. We leveraged our relationships with broadsheet journalists and arranged for interviews with and commentary from our lawyers on events as they unfolded. 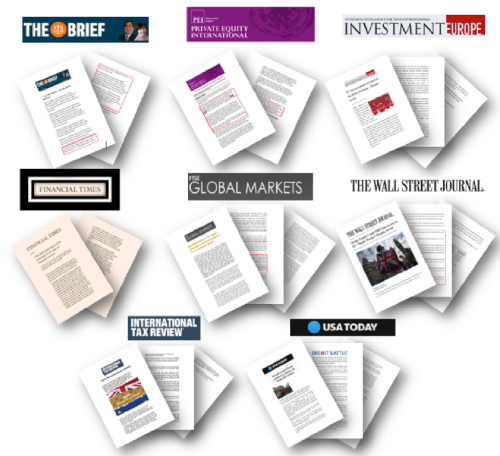 Results: in the lead up to the referendum, we obtained broadsheet and trade press coverage in The Times’ The Brief, FTSE Global Markets, and USA Today, as well as articles in Commercial Litigation Journal, Financier Worldwide, HFM Week and Litigation Funding. Post the referendum, we continued to analyse the impact Brexit would have on our clients’ sectors and practice areas. We obtained broadsheet and trade press coverage on whether UK hedge funds and investment managers could still access the EU single market post Brexit and our client was quoted in the Wall Street Journal, Investment Europe, Private Equity International, and the British Private Equity & Venture Capital Association. A piece was also published in the Financial Times. Further Brexit coverage included coverage in Law360, philly.com, The Street and in International Tax Review. Coverage ensued on the implications of Brexit for life sciences and financial services in Lexis Nexis, FX-MM, Pharma Focus, Investment Week, Journal of Data Protection and Privacy, Fund Europe, e-health Law & Policy, Drug Development Research, Pharmaceutical Market Europe, Pharmaceutical Executive, and European Pharmaceutical Review. Three months after the vote, we obtained broadsheet coverage on ‘passporting’ issues and Brexit in The Times and The Daily Mail. In December 2016 our client commented on Brexit negotiations in The Times. Following Prime Minister Theresa May’s Brexit plan speech in February 2017, our client was quoted in Legal Business and Finance Monthly, and in March 2017 our client was quoted in The Times on Brexit and Data Privacy. As Brexit-related issues continue to dominate the news agenda, so does our activity to showcase our clients’ knowledge and expertise.